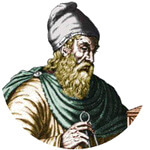 Calculations at an archimedean or arithmetic spiral. This is the simplest form of spirals, where the radius increases proportionally with the angle. The radius is the distance from the center to the end of the spiral. Enter radius and number of turnings or angle. Choose the number of decimal places, then click Calculate. Please enter angles in degrees, here you can convert angle units. 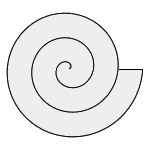 The surface area of the archimedean spiral can only be calculated if the number of turnings is an integer. An archimedean spiral with 3 turnings. Σ is the sum symbol, ln is the logarithmus naturalis (natural logarithm). Radius, parameter a, length, perimeter and diameter have a one-dimensional unit (e.g. meter), the area has this unit squared (e.g. square meter). The number of turnings is dimensionless. The unit of the curvature is 1 / length unit.